On this, our ninth episode, our guest is Benjamin Fowler. Fowler has been playing the drums since he was 12, and teaching since the age of 17. He graduated from the Indiana University Jacobs School of Music in 2008, with a bachelor's degree in jazz studies and percussion. At school he studied with Los Angeles studio stalwart Steve Houghton. He has also had lessons with veteran New Orleans drummer John Vidacovich, and studied regularly with Indianapolis jazz and gospel great Charleston “Deno” Sanders. Over the years, Fowler has played the drums in such bands as Community Currency, The Delicious (Joyful Noise Records), Kentucky Nightmare (Standard Recording), DM Stith (Asthmatic Kitty), and Cardboard. He is currently busy with The Jefferson Street Parade Band and Chainsaw Mondays. Along with the drum set, Fowler also teaches finger picking, rock and jazz guitar, and piano. At the Jefferson Street Music Studio, Fowler coordinates several teachers: They’re all currently active in Bloomington’s music community, and they teach a variety of instruments including trumpet, saxophone, keyboard, banjo, mandolin, vocals and more. Whatever you’d like to learn, the experts at JSMS can help! Ben is the founder of The Limestone Beaters. The group began in June 2012, as Bloomington’s only independent student drum line. In the summer 2014, Aaron Comforty joined as co-director, and the group blossomed into a full-on student brass band: They just recorded their first full length album at the end of April! The Jefferson Street Parade Band can be found on Facebook at www.facebook.com/jeffersonstparadeband. The official website for Chainsaw Mondays is chainsawmondays.com and their Facebook page can be found at www.facebook.com/chainsawmondays. The Limestone Beaters can be found on Facebook at www.facebook.com/limestonebeaters. 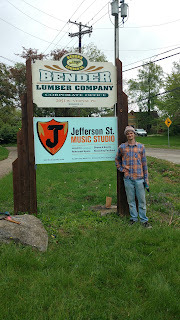 The Jefferson Street Music Studio can be found by searching the name on Facebook or at www.facebook.com/Jefferson-Street-Music-Studio-1805077073049281. The studio can be reached by phone at 812-340-9247 or 812-269-6171. The street address is 2051 W. Vernal Pike, Bloomington, IN 47404. I've compiled a playlist of songs from The Limestone Beaters, The Jefferson Street Parade Band and Chainsaw Mondays. It can be found on the show's YouTube page, which can be found at tinyurl.com/therobburgessshowyoutube. 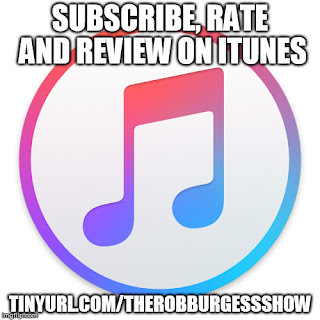 Please rate, review and subscribe to the podcast on iTunes at tinyurl.com/therobburgessshow. Once you're signed in to iTunes, hit "Subscribe." Click the tab on the iTunes page near the top that says "Ratings and Reviews." From there, please leave a star rating (hopefully five stars) and click "Write a Review" to leave a review. Thanks again for the support! If you're an Android user and you're still not sure how to listen, you can also visit the website subscribeonandroid.com/tinyurl.com/therobburgessshowrss and if you have a one-click supported app on your Android device, the app will load automatically.